” Boris Johnson, Prospective Parliamentary candidate for Uxbridge & S Ruislip recently met the leading figures in the Ruislip Against HS2 campaign. He listened to the continuing concerns about HS2’s lack of detail on the effect of any pre work and during actual construction, noting in particular the impact on West End Rd near to Ruislip Gardens. Boris said, ” I can reaffirm my opposition to this scheme unless we can be satisfied beyond doubt that any proposed mitigation builds upon the success we have already achieved by having the route tunnelled through Ruislip. Defeat the need for the Heathrow spur and the tunnel can then go beyond Harefield. My support is also conditional on a suitable direct link to HS1″. There is also an article on the Gazette website. 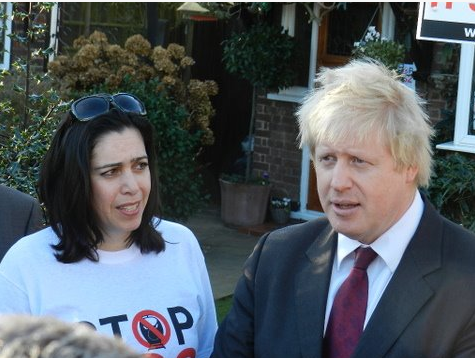 This was our first meeting but not the first time we’ve met Boris and raised HS2.